rom the misty fields, the cold mountains, or the darks woods emerges a lean, female figure, treading the ground with light graceful steps in an unhurried pace. Her long black hair is bound together beneath a leather strap. Her midnight blue eyes are set in a round comely face, youthful and ageless. Although not very tall, the pointed tips of her ears leave no doubt that Emlyn, of the House of Felaeron, is of the Elven race. Clothed in dark leathers, she hardly ever feels the need to wear an outer garment or cape. Her arms are covered in leather bindings for the use of bow and arrow. 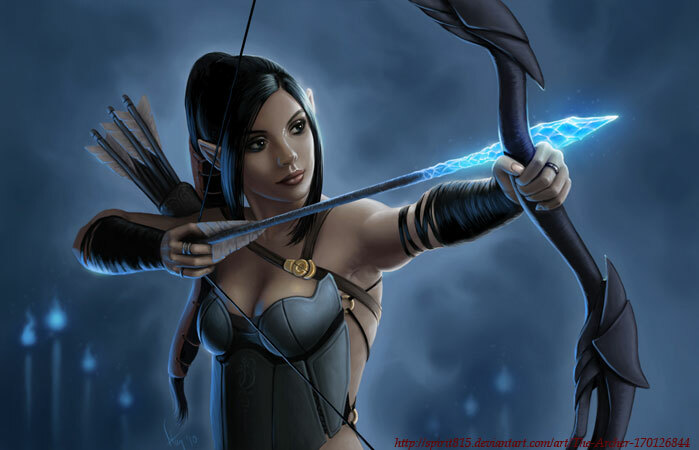 A fine archers bow hangs across her back, daggers are at the ready in her belt. She appears whole and healthy, but after much excercise and at unguarded moments she might be seen gripping her left arm or the left side of her body with her right hand, a grimace of pain overcoming her features. Such moments are rare, as a watchfulness is ever present in her movements. She peers attentively at her surroundings, often smells the air and her ears twist to catch even the smallest of sounds. When spoken to she is slow to react, first she will take her time to assess the speaker and with an Elven patience will think over her answers before she utters them in a low warm voice. Neither does she show any emotion on her timeless features. Only the best observers may see a hint of her feelings on her face; the twitching of her ears, or a barely perceptible lifting of the corners of her mouth. After an enlightening conversation, a satisfactory business transactions or an extended observation, Emlyn will again disappear into the fog, a darkened path or in a sea of trees. orn in the moonlit winter days of the northern Cold Lands of Illarion, Emlyn lived her life in her family’s bejewelled Fortress of Ice. The house of Felaeron, Ice-hunters, consists of a small family group of Elves who are adapted to their harsh surroundings into weather hardened rangers, strong miners and able craftsmen. Their fortress is built in the south face of the mountain range, cut out of the rocks and fortified with large blocks of ice. The family mines the mountain for useful metals and jewels, which they use to decorate the towers of their home, making it stand out glittering and shining on the few summer days when the sun penetrates the thick fog of the northern planes. It is a sight to behold that stops travellers in their tracks and will never be forgotten, even by the longest lived of the Elven race. During most of the year the steppe south of the mountains is covered by thick clouds of mists that float around in eerie patterns. The months of summer are short and although the days are long the sun is weak and the ground infertile. The family survives by hunting the planes and nearby forests, fishing on frozen lakes and foraging occasionally. The winter months are long and the sun is hardly seen, especially between Adras and Zhas, when it doesn’t rise at all above the horizon. Apart from the most sturdy of the Elves, none venture out into the freezing cold during these months. The family retreats into their fire lit caves, working hard in their mines and smithies and taking their rest close to the warm fires, telling each other tales of the early days. As with any harsh region the Cold Lands are also inhabited by the foulest of creatures, those that shun the sunlight. They live in the dark crevices of the ice and deep caves in the rocks, coming out only at night to seek for any unguarded prey. In the light of the sun they turn away in pain from the splendour that is the Felaeron fortress, but in the dark months of winter they have been seen walking the mountains nearby, ever closer. Organised raids of the fortress by demons and their hideous beasts are becoming a common occurrence and the Elves are forced to spend many hours defending their home. Throughout the years they have continued to fortify their defences and as a result the Fortress of Ice now stands strong, unbreakable and cannot be penetrated by their enemies. However on one occasion, after a particular harsh and gruesome attack, some of the younger Elves decided to chase their enemies and fill them with a dread that would hopefully frighten off the pestilent creatures and gain the Elves some years of peace. Unfortunately, this counter-attack went horribly awry as the group of sixteen Elves was led into a trap. In a narrow mountain corridor they were attacked from all sides and the fight turned into a slaughter. Emlyn, being one of the attacking party, managed to escape, but in the fighting the left side of her body was severely crushed. Little bodily pain did she feel as she stumbled back to their fortress, for the horrors that she had seen and the most precious of Elves that she had to leave behind consumed her thoughts. Healing was slow, the feelings of guilt and loss were ever increasing. And so she decided to leave her home and go south into Illarion to find a cure for the loss of her family and the emptiness inside herself.